Photographs copyright of Andy Murch all rights reserved. Identification: Dorsum light brown with many small pale spots. 9 prominent, irregular, dark brown saddles from snout to tip of tail. Saddles corugated and pale edged. Nasal barbells long with fleshy bases. Five groups of dermal lobes (skin flaps) on each side of head: Inner group attached to barbells, second group thin and small, third group long and weakly branched, fourth and fifth groups short and wide. Size: Maximum TL at least 118cm. Birth size approx 21-23cm. Males mature at around 103cm. Females mature between 100-107cm. Habitat: Found on rocky and coral reefs from intertidal to 200m. Distribution: The Japanese wobbegong can be found around the coastlines of Japan, Korea, Mainland China, Taiwan and Vietnam. Diet: Remains motionless during the day usually hidden under ledges. Forages for benthic fishes. Also known to eat skates, shark eggcases, cephalopods and shrimp. Reproduction: Viviparous. One year gestation. 20-27 pups per litter. Conservation Status: Listed as DATA DEFICIENT by the IUCN. 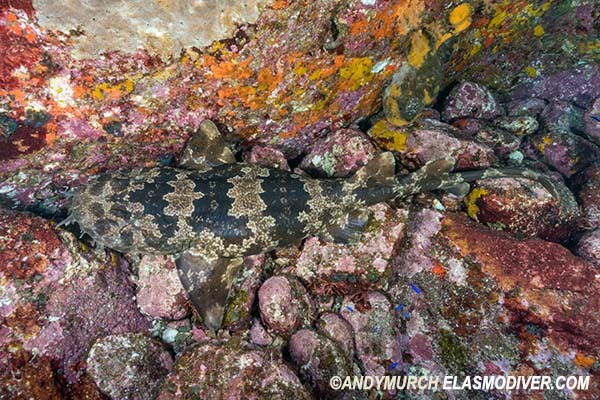 The Japanese Wobbegong (Orectolobus japonicus) is caught in bottom set gillnets in Japan and used for human consumption. It may also be taken in China, Taiwan (Province of China), Korea and Viet Nam, but no data are currently available to determine catch levels or population trends. Despite these threats, insufficient information is currently available to assess this species beyond Data Deficient. 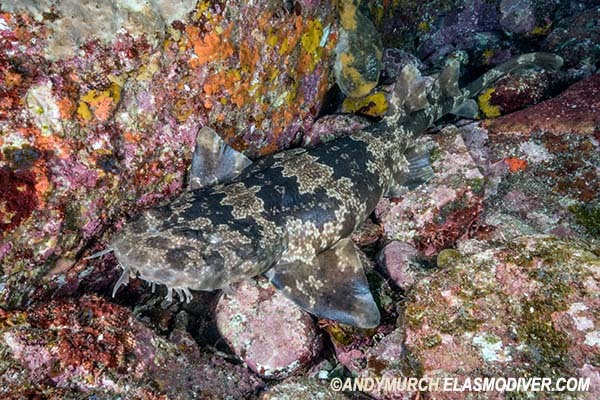 Its distribution in areas historically and presently exploited by trawl fisheries is of concern, particularly as declines have been observed in other wobbegong species where they are heavily fished. Further investigation into threats, population numbers, catch levels and its life-history is required. Photographs: Mikomoto Island, Izu Peninsula, Japan. Similar species: There are at least 12 species of wobbegongs. Most can be distinguished by barbell configuration and markings. The Japanese wobbegong is best identified by geographic range as it is the only orectolobid shark occurring in the orient. Reaction to divers: Remains motionless relying on camouflage unless closely harassed. Diving logistics: This wobbegong can be found at Mikomoto Island at the southern end of the Izu Peninsula on Honshu Island. The largest aggregations are there during the warmer summer months but you can also find a few in October when the scalloped hammerhead schools are there. Independent travel and diving arrangements can be difficult for non-Japanese speakers but Big Fish Expeditions runs a yearly Japanese Shark Safari that includes diving with the schooling hammerheads and wobbegongs as well as many other species. Tanaka, S., Nakaya, K., Wang, Y & Alava, M. 2009. Orectolobus japonicus. The IUCN Red List of Threatened Species 2009: e.T161563A5452171. http://dx.doi.org/10.2305/IUCN.UK.2009-2.RLTS.T161563A5452171.en. Downloaded on 27 November 2017.